And what is the point of the humans.txt file? 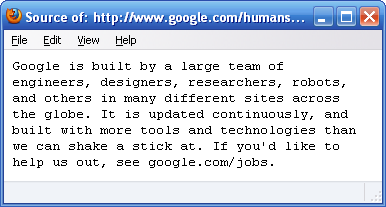 Encourage smart people with a sense of humor to join Google? It's for letting the world know which humans worked on a website. Always nice to see an unexpected Flight of the Conchords reference! I am not satisfied this tips are not complete to understand. Need more detail for me and this blogs's visitors.